(Updated at 4:30 p.m.) It’s now possible to live in Rosslyn’s long-awaited Central Place development. 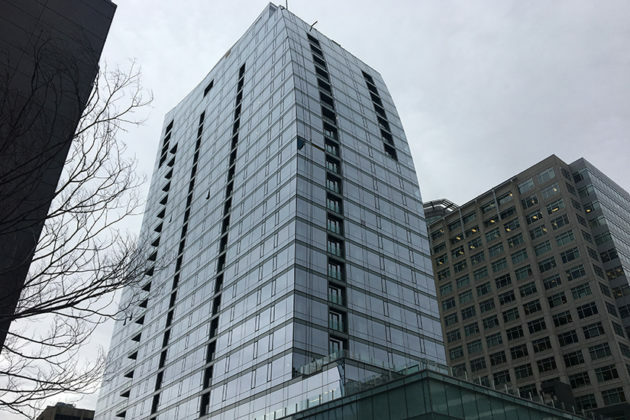 JBG announced today the opening of the residential portion of its Central Place project in Rosslyn, which is one of the tallest apartment buildings in the region. Prospective tenants can now rent studio, one-bedroom, two-bedroom and three-bedroom apartments, and tours will be available starting next week. 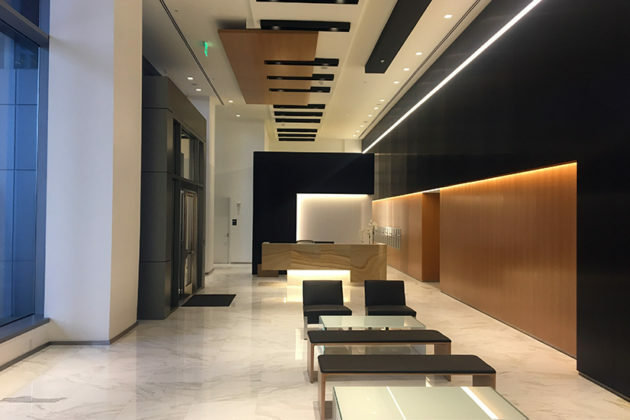 The 31-story mixed-use building, which is located on N. Lynn Street across from the Rosslyn Metro station, features 377 apartments with access to amenities such as a swimming pool, private cabanas and grilling areas, an outdoor fire pit and lounge, a fitness center and massage rooms. The building also has billiard tables, a library, a dog washing station and direct access to the Metro. Restaurants coming to the ground floor of the apartment building include Sweetgreen, The Little Beet and Nando’s Peri-Peri. Those eateries have not yet announced their opening dates. The residential tower is just one half of the Central Place development. 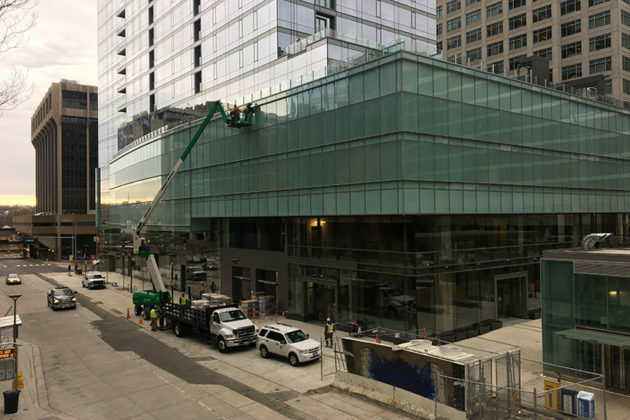 Construction crews are also busy putting the finishing touches on the CEB Tower, a 350,000 square foot office building that is slated to open next to Central Place Residences early next year. The building’s main tenant and namesake is CEB, a publicly-traded company that’s currently based out of a building down the street. 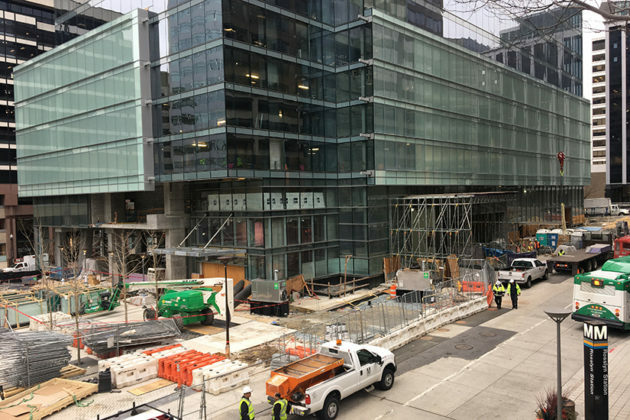 When it opens, the new office building will include a public observation deck once hyped as a possible “game-changer” for Rosslyn. Cava Grill and Compass Coffee also have both signed leases to open in the office tower. It’s not clear whether those businesses will open at the same time as the office building or at a later date. Workers first broke ground on the massive construction project a little over two years ago. Read the full press release from JBG, after the jump. Nearly two years after its groundbreaking, JBG is set to redefine the skyline and lifestyle of Rosslyn with the much-anticipated opening of the residences at Central Place. The 31-story mixed-use development, located in the heart of Rosslyn, is the most visually exciting development to come to the Washington, DC area. The magnificent residences feature open floor plans with epicurean kitchens, fine cabinetry and expansive windows that welcome abundant light and spectacular views. Built for entertaining, relaxation and comfort, the residences at Central Place set a new standard for sophisticated living. The residential tower, which is a JBG joint venture with the State Teachers Retirement System of Ohio, offers 377 impeccably appointed living spaces designed by internationally renowned, Toronto based firm Cecconi Simone. During the opening month of the residential tower, new residents will receive a special offer of up to a half month free rent. 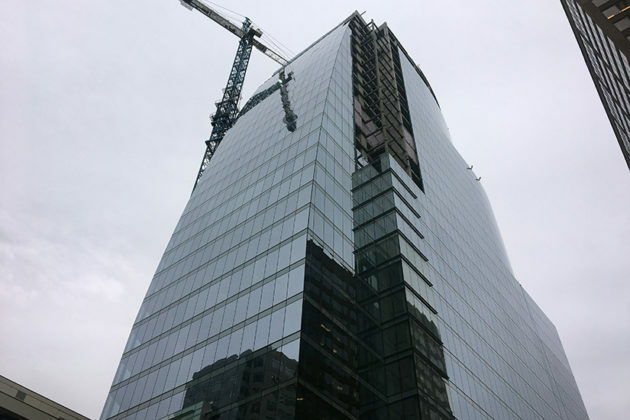 Central Place is a 1 million-square-foot development featuring dramatic glass facades on the residential tower and companion class-A office building, a 17,000-square foot public plaza and an observation deck offering incredible, unobstructed views of the National Mall. Large enough to host public events, the plaza will offer outdoor seating, a splash fountain and mix of street level retail and fast-casual dining offerings including Cava Grill, Compass Coffee, Nando’s Peri Peri, sweetgreen, and the first Northern Virginia location for The Little Beet. The plaza will also provide a pedestrian connection between North Lynn and North Moore Streets, and is anchored by three high-speed elevators that provide direct access to the Rosslyn Metro station. Beyer Blinder and Belle Architects and Planners, known for the revitalization of Rockefeller Center in New York City, was tapped by JBG to design Central Place. Their forward-thinking design not only dramatically transforms Rosslyn, but also creates a strong sense of neighborhood that did not exist previously.